The Secret Recipe Club is great for people like me! It’s like “Secret Santa” but with recipes. Who wouldn’t love that? Woo-hoo! You are assigned a blog to check out, then you need to find something yummy to cook, make it, take some pics and post about it. Totally fun! It really helped me to commit time to exploring the blog I was assigned. I loved having a goal to get to know my assigned blog a bit better. 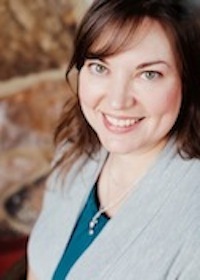 Kristi is a vegetarian, with an omnivore hubby and 2 undecided kiddos. She made a New Year’s resolution to create “blended-family” meals that everyone would eat in her household. She works on converting traditional family meals into meatless recipes that her family will eat and enjoy. I knew what I would make right away. 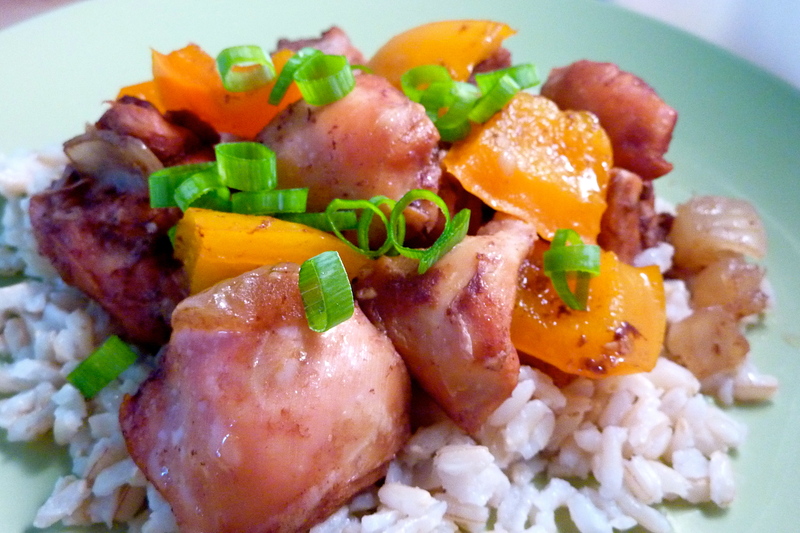 Kristi had posted a recipe for Slow Cooker Plum-Balsamic “Chicken” and had wondered on Skype if it would work with boneless chicken thighs for people who use them. Well, easy-peasy, Kristi! It works just fine! I used boneless, skinless chicken thighs for the mock-chicken (all of which have gluten in them that I know of, so off limits for us…) and it worked out really well. The only change I would make next time is to skip the veggie broth (my version reflects this) as the chicken thighs produce plenty of juices for the dish while they cook. I am a sucker for slow cooker recipes and anything that helps me use up the crazy amount of jellys and jams I make every year. Lightly oil slow cooker. Add all ingredients except for the bell pepper pieces. Stir everything until mixed well. Top chicken mixture with bell pepper pieces (you need to leave the peppers on top so they don’t over cook). Cover and cook on low for 2 1/2 hours or for 5 hours on low, until chicken is cooked through. Serve over rice, quinoa or baked sweet potatoes. 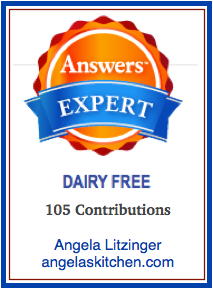 Of course, Kristi’s is a vegetarian blog. As my family was vegan in our gluten-filled days, it just seemed like I should be making a vegetarian recipe from her blog, after all she is the Veggie Converter! 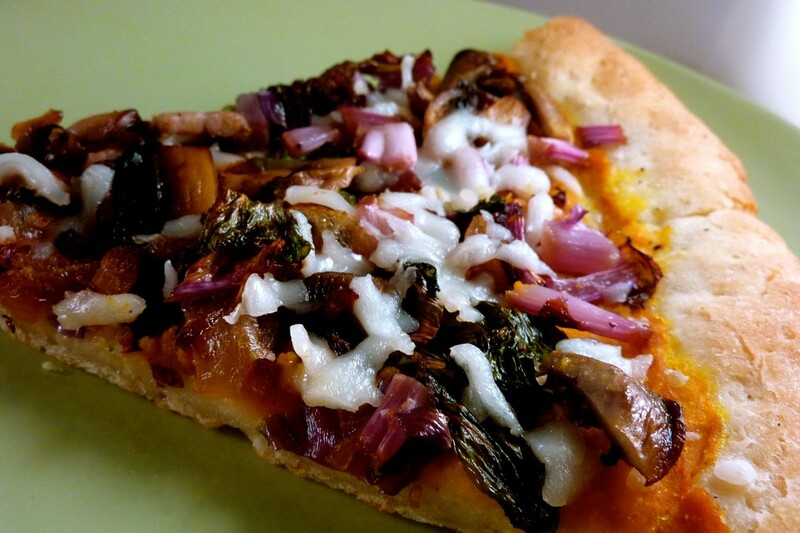 I went through her site a bit more and found this really fun take on pizza, a Squash and Kale Pizza. I used my gluten free pizza crust, used pumpkin instead of squash (as that is what I had on hand), added a bunch of roasted garlic (because that is how I roll) and tweeked the seasonings a bit for fun. I think this is a recipe that will freeze really well. I might make this as an appetizer for Thanksgiving made as a long thin rectangle with an added topping of either sun-dried tomatoes, kalamata olives or toasted pinenuts as a flavor contrast to the rest of the pizza. To make this dairy free, like we need, use a drizzling of Cashew Cheesy Sauce to replace the cheese to make this pizza a vegan delight. I am linking up the pizza to Slightly Indulgent Tuesday over at Amy’s blog, Simply Sugar and Gluten Free. Prepare dough, shape on oiled parchment paper and set aside. Mix roasted garlic, nutmeg and salt and pepper to taste with the winter squash until well blended. Spread on pizza crust as the sauce. Heat 3 tablespoons olive oil in a skillet over medium-high heat and cook the mushrooms until golden. Remove mushrooms to a plate and set aside. In the same pan, add the last tablespoon of olive oil and onions. Cook onions until lightly caramelized. Add kale to pan and stir fry with onions until wilted. Season with salt and pepper to taste. Spread kale onion mixture on top of squash, then top with mushrooms. (I plan on adding sun0dried tomatoes, kalamata olives or toasted pinenuts as a flavor bright-note/contrast the next time I make this. Add your choice, if desired, with the mushrooms.) Top with about 1/2 cup of dairy free cheese sub of choice (I drizzled a bit of cashew cheese on mine, as I had some on hand), if desired. Bake at 400 for 15-20 minutes until crust is golden and pizza is cooked through. Thanks, Kristi, for letting me poke around your blog and for a couple new tasty recipes! And also a big thanks to The Secret Recipe Club hosts, Amanda – Amanda’s Cookin’, Angela – Big Bear’s Wife, Tami -Tami’s Kitchen Table Talk and Tina – Mom’s Crazy Cooking. More information on the club can be found on the official Facebook and Twitter pages! Hah. That's awesome that the chicken thighs worked Angela. How funny that you got my site. I love the sound of that cashew cheese sauce. That's definitely going on my t0-try list. Thanks for making the recipes look extra delicious! Squash as a sauce on pizza sounds so different and so delicious. I love that SRC stretches us out of our normal cooking focus. These are great recipes. What a great veggie pizza - love how the typical tomato sauce is replaced with squash. Love kale too, but never had it on pizza. that pizza looks like it came right out of the oven of my favourite pizzeria! Just amazing. Interesting pizza flavors! Looks delicious. Visiting from SRC.